Heat oven to 400°F. Line 16 muffin cups with foil or paper baking cups. 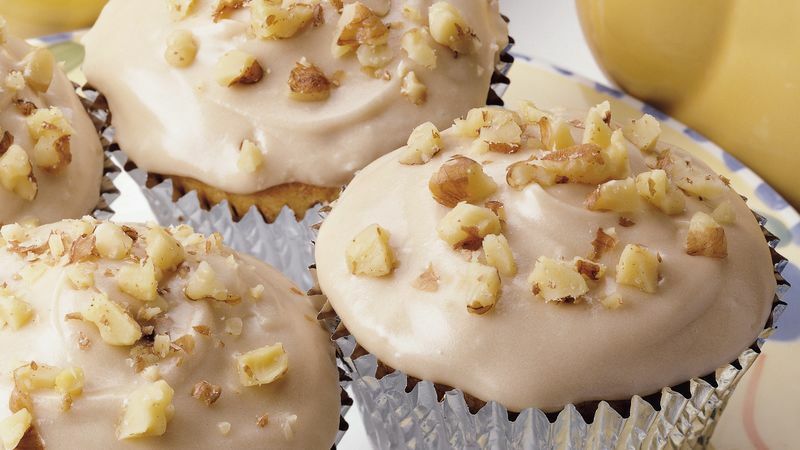 In large bowl, combine all cupcake ingredients except walnuts; stir 50 to 75 strokes with spoon until mix is moistened. Stir in 1/2 cup walnuts. Spoon batter evenly into lined muffin cups. Bake at 400°F. for 16 to 20 minutes or until toothpick inserted in center comes out clean. Cool 5 minutes. Remove from pan. Cool 30 minutes or until completely cooled. In small bowl, combine all frosting ingredients except powdered sugar and walnuts; beat at low speed until smooth. Gradually add powdered sugar, beating until mixture is of spreading consistency. Frost cooled cupcakes. Immediately sprinkle with 1/4 cup walnuts. Store in refrigerator.